All four of our heroes are at Leonard and Sheldon’s apartment. Sheldon is upset because the meat, cheese and lettuce on his sandwich is in the wrong order. (Apparently the cheese is suppose to go next to the bread to build a moisture barrier between the lettuce and the bread, I will be trying this). Leonard is on his laptop and can’t believe that someone is auctioning off a miniature time machine movie prop from the original movie “Time Machine” and no one is bidding on it. Raj is surprised that it is only 800.00, Leonard says that is his bid he thought it would go for much more and just wanted to be a part of it. Howard says not to worry; snipers always wait until the last minute and swoop in and put in a higher bid on these auction sites. Raj counts down, Leonard can be heard saying come on snipers and all the sudden Leonard owns a Time Machine movie prop. Leonard says he can’t afford it and Howard wants all four to pitch in 200.00 so they can share it. Raj comes up with a timeshare, time machine and he is in. Sheldon in his way cool Flash shirt agrees. Sheldon doesn’t understand why no one else bid. Pan to the guys in the lobby with a FULL size time machine prop and now we get the feeling we know why no one else bid (personally I think it is MUCH cooler) The guys are staring and Sheldon says he understands why no one else bid….Cue the Music. Back to the guys in the lobby where we find out that Leonard assumed it was miniature. Leonard wants to know how they are going to get it upstairs. They decided they are going to remove the disk and move it upstairs. The time machine is stuck in the stairwell and Penny comes out trying to get downstairs because she is late for work. Sheldon suggest she go to the roof and hop over to the next building, an idea that Penny does NOT like. Leonard makes a time machine joke and Penny gives him what I refer to as “the Look”. We are in the guys apartment and they are all staring again at the time machine that takes up a lot of room. Leonard has never owned anything this cool and Sheldon is even impressed. (I want to know if they are going to move this thing every week, or month or something since they all own a piece of it) Howard thinks it is a chick magnet. Raj just wants to rub it in to his neighbor because his neighbor is always bragging about his Jacuzzi. Sheldon thinks they should reevaluate the practicality of moving it (ha on the same page as Sheldon, that is a little scary). Howard wants to move it because he doesn’t want to have to bring girls over to see his cool time machine at his friends house. Sheldon votes that besides the no shoes in the time machine and no eating in the time machine, they should make a rule you must wear pants in the time machine. Leonard seconds it and Howard says he was going to put down a towel. Raj still wants it on his balcony. So they agree to move it bi-monthly, so every other month. Leonard gets in the time machine. The guys geek out. Including Sheldon who does some quick math and figures converts a star date from Star Trek to our calendar so Leonard can go to the future and still a cloaking device. Leonard, still sitting in the time machine sets the date and pulls the lever. The other three start moving quickly and pantomiming motions as if they are rapidly moving forward in time, for those who have seen the movie “Time Machine” you know exactly what I mean. Leonard brings the lever to a halt and the guys slow down. Leonard says that was fun and Raj says it is his turn. Penny walks in and tells Sheldon what he called a gap was three feet wide. Then the stairwell door on the other building was locked so she had to go down the fire escape which ends on the third floor and crawl in the window of a family who fed her 8 courses of Lamb and tried to fix her up with their son. Then when she got to work, they had given her shift away all because of what they call a time machine and she refers to as, as when she can’t come up with a name Sheldon says time machine and earns “the Look”. Leonard says the lights flash and the disk spins and does she want to try it? Penny goes off…they are grown men and she doesn’t understand how they can waste their lives with the stupid toys and comics and that. 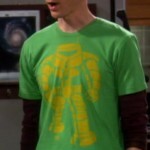 Sheldon says Time Machine again even though Leonard tries to wave him off. Penny points out that it is no time machine and more resembles something Elton John would drive through the Everglades. Sheldon missing the point says it only moves through time and it would be worse then useless in a swap. Penny responds with “Pathetic, all of you PATHETIC”, and leaves. While the other guys go back to playing Leonard has a sad serious look on his face. Leonard is sitting in the time machine with a serious, thoughtful look on his face and Sheldon walks in tying his robe and pointing out it is 2:00am. Sheldon wants to know why Leonard set the date for the day before yesterday and Leonard responds he wants to stop himself from going back to get a time machine. (WOW, that was fast shipping) Sheldon explains to Leonard about creating a paradox. Leonard wants to knock him unconscious. Sheldon wants to know if Leonard is upset about something. When Leonard asks what Sheldon first clue was; Sheldon actually list the clues. Sheldon starts to go back to bed and then asks if Leonard wants to talk about it. Leonard points out that girls like Penny never date guys who own time machines. Sheldon uses movie examples to make the point that sometimes they do. We flash back to the guys trying to get the time machine up the stairs and Penny coming out of her apartment late for work. This time Leonard takes off his glasses pulls open the elevator doors, grabs a cable, tells Penny to hang on and that this is more important then toys. They start to go down the cable and Penny kisses Leonard. 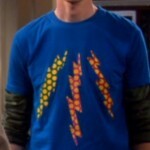 We flash to Leonard dreaming in the time machine and Sheldon staring at him. Cut to the next morning with Sheldon coming out of his room and Leonard packing his “toys” (Leonard a word of advice if she doesn’t like you for who you are and your toys, screw her). He is planning on taking them to the Comic Book store and selling them. Raj and Howard come in and Leonard asks if anyone wants to buy his share of the time machine. The bidding war starts. Leonard says no more replicas, toys, costumes, action figures or props or Darth Vader voice replicas. Howard says he can’t do that because Leonard has created Nerdvana. Raj calls dib’s on the golden age Flash. Howard wants Leonard Collection, as do the other two- this starts another bidding war. Leonard walks into the hallway, the other three try to stop him from leaving. Sheldon grabs a sword and blacks the stairway saying, “None shall pass” –Go “Lord of the Rings”. Leonard says he can’t believe they are making him do this but he pulls at a limited edition Star Trek the Next Generation, Geordi La Forge action figure without the visor, in the original packaging and tells the guys if they do not move, Leonard is going to open it. Penny comes out into the hall and wants to know what is going on. Sheldon accuses her of being a hypocrite. She said that adults don’t play with toys but he wants to know that if he went into her apartment would he not find Beanie Babies, Stuffed animals and Hello Kitty who is even now on the shorts she is wearing. Penny apologizes about yesterday; she was just really upset. She tells Leonard that his love for this stuff helps make him the great guy he is. Howard says he must be really large breast. Leonard says Penny was right and he needs to get rid of this stuff and move on with his life. Penny says if he is sure and hugs and kisses his cheek. As Leonard is about to ask Penny out, a hunk shows up and asks Penny if she is ready. Penny says she needs to change and Mike chases her into her apartment offering to help. Leonard has a sad look on his face while the rest of the guys stare at him. He looks at his action figure puts it back in the box and says it is his turn in the time machine and they all run into the guys apartment. Sheldon is in the time machine and surrounded my forest the date on the time machine is April 28th 802701-(hey is that where Wall-E got it’s date from a salute to “Time Machine”). All of the sudden the flesh eating Morlocks come to get him. Sheldon wakes up in the time machine, screaming. Leonard comes out to check on him and wants to know if he is ok. Sheldon says they have to get rid of the time machine, Leonard agree it is just to big for the living room-Sheldon says yes that is the reason (although we get the feeling it is not). Leonard tells Sheldon not to worry. Leonard has hired some guys that can help get rid of the time machine and in walk the Morlocks. Sheldon wakes up screaming again, in his own bed this time screaming for Leonard.